When life gives you lemons, it’s time to read this list. We researched all of the miraculous things you can do with lemons, from the juice to the peel. Uses include making you healthier, more beautiful, cleaner, and a better cook (obviously), plus so much more. ShutterstockLemon juice can fight odours and make your home smell amazing. Freeze lemon slices in plastic ice cube trays with vinegar. Once frozen, you can place a few cubes down the disposal, turn on the water, and run it for 30 seconds to clean and deodorise. Freshen your fridge: Soak a cotton ball or sponge in lemon juice and leave it in the fridge for a few hours — your fridge will smell so much better, and it works even better than baking soda. Make a DIY room freshener: Throw lemon peels, cloves, and cinnamon sticks into a pot of simmering water. It will make your whole house smell amazing, get rid of odours, and humidify the air, too. Deodorise the humidifier: Pour in lemon juice with the humidifier water. Turn it on and let it run — the lemon juice will naturally deodorise the machine plus make the room smell fantastic. Make your breath smell better: Drinking lemon water and combat the bacteria in your mouth. Just make sure to rinse with water afterwards since lemon juice can erode your teeth. Deodorise trash cans: Throw a few peels into the trash can to keep everything smelling as fresh as possible. Make the fireplace smell amazing: Use dried citrus peels like lemon and orange as kindling — to prepare, let them sit out on the counter for a few days so they can fully dry. They will act as a flame starter and will make the fire extremely aromatic. Remove odours from hands: Whether it’s garlic or fish, cooking can make your hands smell horrible. Wash them with lemon juice and some soap to eliminate unwanted odours. 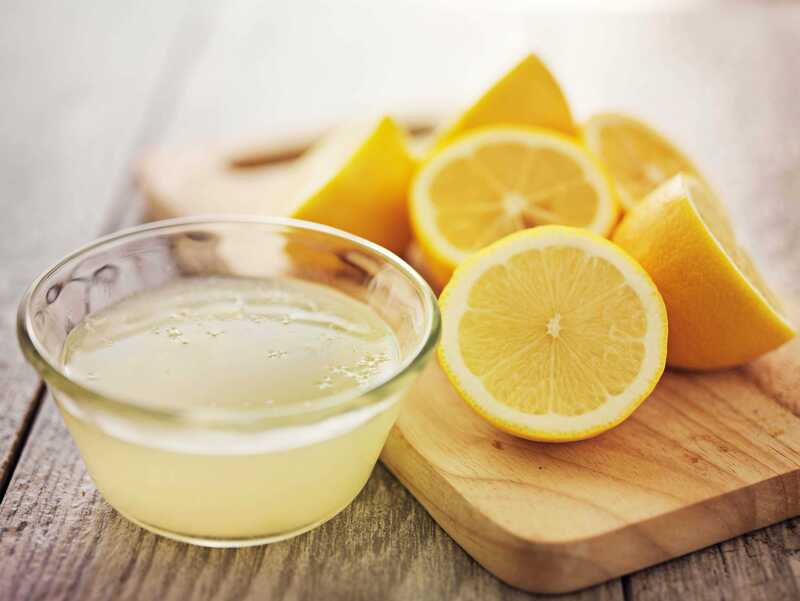 Neutralise cat-box smells: Make your home smell better by neutralising the acidic smell of your cat box with a few lemon slices placed nearby in a bowl. It will have the same effect as store-bought air fresheners. ShutterstockFrom cutting boards to windows, lemon juice can clean just about anything. Make a homemade furniture polish that will smell better and cost less than typical polishes out of lemon oil, squeezed lemon juice, and olive or jojoba oil. Combine the ingredients and buff with a cloth. Remove food build up from a microwave: Place a bowl of water, lemon juice, and slices of lemon into the microwave. Heat on high for three minutes and remove the bowl. Any leftover food that used to be caked on will wipe right off and your microwave will smell amazingly clean. Clean windows: Because it’s acidic, lemon juice is great at cutting through grease or grime build up on windows and glass. You can also mix it with cornstarch, vinegar, and water for an even better window cleaning treatment. Remove hard water stains from faucets: Hard water can make your tub dingy and leave you with unsightly stains on faucets and shower heads. Remove build up by taking a cut lemon and rubbing it on your shower fixtures — they will look shiny and new when you’re done. Clean cutting boards: Freshen your dirty, greasy cutting boards with a handful of coarse salt and a cut lemon. Sprinkle salt on the cutting board and then rub it in with the cut side of a lemon. Wipe off the salt or rinse the board in the sink — easy. You can do the same thing with rolling pins and wooden salad bowls. Revive your old coffee maker: Run your coffee maker through a full water-only cycle. Then, mix a solution of lemon juice and water together and pour it into your coffee maker water tank. Allow it to sit before turning it on and letting it run through the cycle. Make a fresh solution and repeat the process. Run another water cycle and soak the carafe, filter, and coffee reservoir in dish soap and water to remove any lemon taste. Clean marble: To remove rust stains from marble, sprinkle baking soda on the stain and add some lemon juice. Scrub and add more lemon juice and baking soda as needed. Wipe immediately with a clean, wet rag. Polish brass and copper: Combine equal parts lemon juice and vinegar and then wipe the mixture on the metal with a paper towel. Polish with a soft cloth until dry. You can also combine lemon juice and baking soda to make a paste and have a similar effect to remove tarnish. Polish silverware: Mix a tablespoon of lemon juice with 1 1/2 cups of water and 1/2 cup instant dry milk. Let the silverware sit overnight and then rinse and dry. If you’re in a hurry, simply pour some lemon juice on tarnished pieces of silverware and buff with a clean cloth. Make your dish soap more effective: Add a teaspoon of lemon juice to dish soap to cut through grease on dishes and make your soap even more effective. Bleach plastic Tupperware: If your Tupperware is soaking up colours from your favourite spaghetti or tomato soup, rub with some lemon juice and let it dry in the sun to bleach away the stains. Clean the toilet: Pouring in 1/2 cup of lemon juice and letting it sit will make toilet stains easy to tackle with a brush (and make the bathroom smell citrusy). You can also add 1/2 cup of borax for extra stain fighting powers. Unclog a drain: Pour boiling water down the drain and then half a box of baking soda followed by 8-12 ounces of lemon juice. The lemon juice will react with the baking soda causing it to turn into a foam. Then pour more boiling water down the drain to rinse away the foam and the clog. 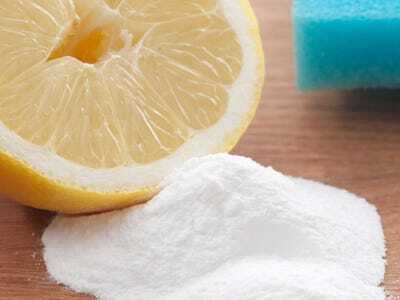 Remove water stains on shower doors: Cut a lemon in half and dip one half into baking soda. Rub onto the glass and then rinse and dry. Create an all-purpose cleaner: Combining water, baking soda, vinegar, lemon, and lemon essential oil will create an amazing all-purpose cleaner for the kitchen or the bathroom. Get directions here. Clean cheese graters: Instead of ruining your sponge, clean your cheese graters using a half of a lemon instead. It won’t matter if it gets grated a little and the acid in the lemon will cut through the cheese easily. Polish hardwood floors: Make your own lemon-vinegar floor cleaner to fight mould, bacteria, and germs. It also has the added benefit of being non-toxic and will make your floors look great. Add lemon juice to hot water and soak your white linens. Then rinse and wash as normal. You can also add 1/2 cup of lemon juice to your cycle instead of bleach for similar results. Spot treat your shirts: Pour lemon juice on the stain and add some table salt. Rub the stain between your fingers and then rinse. This is especially helpful with dark underarm stains, and will be even more effective if you let the clothing dry in the sun. Get mildew stains out of clothes: Make a paste with lemon juice and salt and rub it into the infected area. Let it dry in the sun, and repeat until the stain is gone. Remove grease stains: Mix lemon juice with vinegar and apply to the stain. Let it sit and then rinse off. Whiten tennis shoes: Spray lemon juice on white athletic shoes and let them dry in the sun. It will bleach the fabric and even make them smell better. After slicing up your fruit, keep it from oxidizing and turning brown by soaking in a cold bowl of water with lemon juice. Take out produce and pat dry.This works with apples, cauliflower, bananas, pears, potatoes, and avocados. Revive limp lettuce: When lettuce starts to get soggy, you can soak the leaves in a bowl of cold water with the juice from half a lemon. Refrigerate for an hour and then dry leaves before adding to salads or sandwiches. Keep rice from clumping: Add a spoonful of lemon juice while rice is cooking so it doesn’t stick together at the end. Let it cool when it’s done and then fluff with a fork. Upgrade your ice cubes: Freeze lemon slices in ice cube trays (or cupcake trays if you want bigger ice cubes) and use them to add some zest to a standard glass or pitcher of water. Marinate meats: Lemon juice is a brilliant marinade when added with oils and herbs. The acid in the lemon juice will break down the meat so that the oil and spices can flavour it even better. Make candied lemon peels: Instead of throwing away your lemon rind, you can make candy out of it that you can put on cakes, into cookies, or just eat as a snack. All you need to do is boil the peels a few times with sugar and coat in sugar. Keep brown sugar soft: Adding a lemon slice to brown sugar will keep it soft. The moisture from the lemon will keep the sugar from becoming rock hard and unusable. Boost flavour and reduce salt intake: Studies have shown that if you use lemon juice and lemon zest, you’ll use less salt to boost the flavour of your dishes. It’s a healthier alternative instead of constantly reaching for salt and pepper. Make a buttermilk substitute: If you don’t have buttermilk, add two tablespoons of lemon juice to a 1% or 2% cup of milk. Let it sit so the acid sours the milk for 15 minutes and then add it to the recipe. Make a sour cream substitute: Similar to the buttermilk tip above, lemon juice will sour whipped cream if you let it sit for 30 minutes or so. It will also cut your calories if you’re used to adding a dollop of sour cream to a baked potato. Make lemonade: You know what they say about life giving you lemons. Add some gin if you want a grown up lemonade. 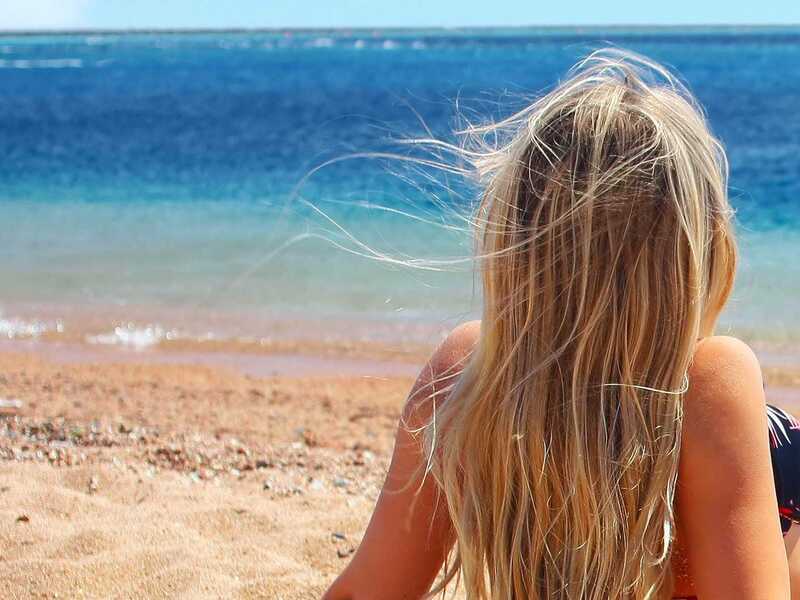 ShutterstockLemon juice will brighten hair in the sun. Fade age spots or freckles: Lemon juice will lighten and brighten skin by reducing freckles as well as fading age spots. Wash you face, pat dry, and then apply lemon juice with a cotton swab. Make a brightening moisturizer: Mix coconut oil with a few drops of lemon juice to hydrate skin and brighten it at the same time. Since both are anti-fungal, the mixture will also help prevent acne. Whiten and strengthen nails: Mix lemon juice with olive oil and soak your nails. The lemon juice will brighten the nail while the olive oil will strengthen it. Fight dandruff: Massage two tablespoons of lemon juice into your scalp and then rinse with lemon water. Repeat until dandruff is gone. Fight acne: Lemon juice is a natural astringent which will fight the oil and clogged pores that can cause acne. After cleaning your face and patting dry, apply lemon juice to your face. After 10 minutes, rinse off with cool water. Repeat twice daily. Exfoliate your skin: Combine lemon juice, sugar, olive oil, and honey to create a nourishing scrub for your skin. Apply to your body and face before rinsing off. 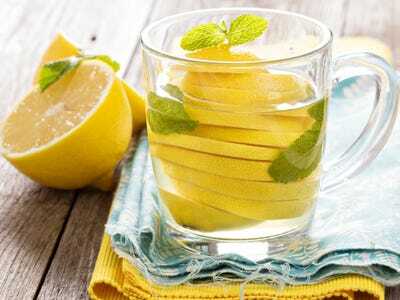 ShutterstockDrinking lemon water is good for you since it has potassium and Vitamin C.
:Drinking lemon water will give you a dose of Vitamin C, potassium, and will aid digestion and give your immune system a boost. Soothe a sore throat: Lemon juice has anti-inflammatory and antibacterial properties which can help a sore throat. It also has lots of Vitamin C to help boost your immune system. Treat canker sores: Because lemon is both anti-fungal and antibacterial, it will speed up the recovery time of a canker sore. Simply add lemon juice to a cup of hot water. Let steep, and then gargle with the solution. It will sting, but that means it’s working. Soothe skin rashes: Soak a cotton ball in lemon juice and apply to the rash. This works especially well with poison ivy. Stop itchy insect bites: Rubbing a bit of lemon juice on insect bites will relieve the swelling and itching. Just make sure not to go outside with it on since you might attract more bugs. Reduces phlegm and soothes a cough: Adding a little lemon juice with honey to hot water will reduce mucous build up, which can help you get better faster. Remove warts: If you don’t want to go to the doctor to treat your wart, try lemon juice as a do-it-yourself option. Dabbing lemon juice on the wart will break it down and it should disappear in two weeks. DIY your own shoe polish with olive oil and lemon. Combine one part lemon juice with two parts olive oil and let it sink into the leather of your shoes. Wait for 10-15 minutes and then buff with a cloth. Make invisible ink: Squeeze lemon juice into a bowl of water and then dip a cotton swab into it. Write a message on white paper and then wait for it to dry before heating the paper close to a lamp or light bulb to see the message. Sanitize jewellery: Add a tablespoon of lemon juice to 1 1/2 cups of water. This is especially good for sanitizing earrings, but should not be used on pearls or gold. Repel bugs from your home: Mop your floors with lemon juice and water to ward off roaches and flees, and spray concentrated lemon juice on any areas you think bugs like ants may be getting in. Bonus points if you throw some lemon peels outside of entryways. Remove pet stains from fur: Pinkish-red stains can sometimes form around your pet’s eyes and mouth. To remove these stains, combine baking soda and lemon juice and rub it onto fur. Keep it away from your pet’s eyes and wait for about 10 minutes before rinsing off. Always check with a vet first to make sure it’s safe. Remove berry stains from your hands: Berries can dye your hands red if you’re not careful, especially if you’re slicing, rinsing, or cooking with them. To get rid of them, make a paste of cornmeal and lemon juice and rub onto hands, let sit, and rinse off. Kill weeds: Lemon juice will kill any weeds you don’t want growing in your yard or driveway. Fill a spray bottle with the juice and douse the offending plants. Make your own dog and cat repellent: If neighbourhood cats and dogs are using your lawn as a litterbox, combine lemon peels with coffee grounds and place them where the pets usually ‘go’ — they hate the smell and will soon head to other yards. Save hardened paintbrushes: If your paintbrushes look like there’s no saving them, bring lemon juice and a little water to a boil and throw in the brushes to sit for 15 minutes. Wash them with soap and water afterwards and let dry. Bristles should feel soft again. Did we miss your favourite thing to do with lemons? Let us know in the comments!